Information Proliferation is an independent, web-based project by Fall 2015 Fellow, Mariela Acuna. Acknowledging challenges in understanding contemporary art, Information Proliferation creates a context for selected works in Girls' Club's current exhibition, Self-Proliferation. The project provides information about the artists, their career and their specific body of work. By sharing her findings, Mariela hopes to enhance accessibility and appreciation for the works. My research methods are very straight forward. I started by reading things that sparked my curiosity. Bibliographies in artists' websites are a great place to look for interesting articles by interesting writers. Looking thoughtfully art the art is important. We often don't give ourselves enough time to look at art objects, ask ourselves questions and give ourselves the authority to reach our own conclusions. So think about it, and share! Do you find contemporary art can be confusing? What resources do you wish galleries and museums would provide? Do you find yourself spending more time with art that you understand vs. art that is confusing? As a viewer, do you think its worth investigating art that you don't understand? How would you do that? As part of Information Proliferation's goal to enhance understanding, and appreciation of artwork by contemporary women artists, Mariela is encouraging a conversation about the artwork shown below and she wants to hear from you! Mariela Acuna was born in San Jose, Costa Rica and relocated in South Florida in 2008. She earned a BA in Art History and a BFA in Sculpture from Florida Atlantic University. During her time at FAU, Mariela worked at the University Galleries where she quickly grew from intern, to student employee to guest curator. In the summer of 2014, she worked as an artist liaison intern at Lehmann Maupin, New York. Mariela curated New Art: South Florida, an exhibition that presents recent works by artists who were awarded the 2015 South Florida Cultural Consortium Visual and Media Artist Fellowship. She currently works at Norton Museum of Art as the Family Programs Coordinator. More information on Mariela and her fellowship projects can be found at www.girlsclubcollection.org/hello-fellow-mariela-acuna. She recalls spending several hours a day watching films in the basement of her family’s home. The black and white photographs in this series are made to resemble European films from the 1950’s and 1960’s and their characters are imagined to mimic the raw, expressionless female characters portrayed in those films. When she began to work on this series, 23 year-old Sherman had recently moved to New York City after completing her education at SUNY Buffalo State. She was living in a small studio apartment on Fulton Street that she used as her studio. She was making art with limited space and resources and working alone, which she continues to do today. Working alone allows her to imagine and become her characters, design the space to photograph them and even imagine their personalities or what they were thinking at the time. Untitled Film Still #19 was shot outside, however, many of the photographs from the same series were taken in her studio apartment. The photos that were taken outside, such as the one in Self-Proliferation, required the assistance of a second person to help her take the photograph. She was often assisted by artist, Robert Longo, who was her boyfriend at the time, Charlie Sherman, her father, or others. In her essay included in her monograph by MoMA, The Complete Untitled Film Stills, Sherman recalls having great fun with her friends and family as she dressed and undressed in the middle of the road each time that she felt she found a great “spot” to photograph a character that she had in mind. 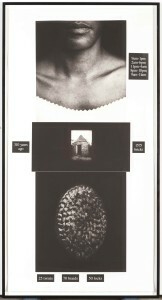 As she developed this body of work, Sherman was interested in implying a narrative through a still image. She had worked on video while she was at school in the 1970s. When the Untitled Film Stills series is presented together, as it was exhibited for the first time at the Hirshhorn Museum and Sculpture Garden in 1995, you may begin to notice narrative threads throughout the photos as the same character is found in multiple photos with similar yet different expressions. The character in Untitled Film Still #19, also appears in Untitled Film Still #17, #18, and #20. In 2012, the Museum of Modern Art in New York presented a survey exhibition of Sherman's career to date. Although the exhibition was not presented chronologically, it demonstrated that Untitled Film Stills was the last body of work that Sherman photographed outdoors. Since the 1980s, Sherman has been working in her studio and using color instead of black and white photographs. Also, Untitled Film Stills is the only series of works that Sherman titled, others have been given unofficial titles by curators or historians who have written about the work. 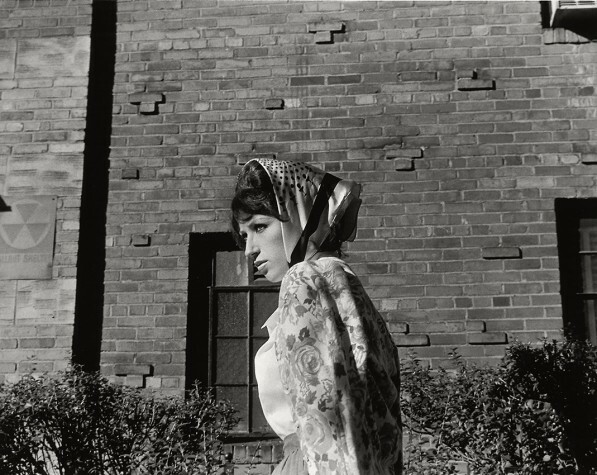 Cindy Sherman, interviewed by Mark Stevens, “How I Made It: Cindy Sherman on Her ‘Untitled Film Stills’” New York Magazine, April 7, 2008, accessed June 2, 2012. Originally trained as a documentary photographer during her undergraduate studies at the School of Visual Arts in New York, Simpson became a pioneer on conceptual photography in the 1980’s while completing her studies at University of California, San Diego. It was in San Diego, that Simpson began to experiment with text and image. Some of her peers at that time include contemporary photographers Carrie Mae Weems and Martha Rosler, (both included in Self-Proliferation) who are also known for pushing the limits of photography. The numbers in this work function both as quantifiers and measurements of time. They tell us how many bricks were used and how long ago. Labor is measured in terms of time and product. How many hours did you work? Where? What did you produce? By using language to suggest an alternative understanding of photographic meaning in her work, Simpson invites her viewer to question issues of gender, race, labor and the notion of photographic truth. Kellie Jones, EyeMinded: Living and Writing Contemporary Art (Durham: Duke University Press), 82. Kellie Jones, EyeMinded: Living and Writing Contemporary Art, 92. Ida Applebroog was born in the Bronx into an orthodox jewish family. She attended the New York Institute of Applied Arts and Sciences to earn a degree in graphic design. Her and her husband later decided to move to Chicago, where Applebroog attended the School of the Art Institute of Chicago and enrolled in television correspondences school. After living in Chicago, her and her family moved to San Diego. In 1977 she taught at the University of California, San Diego before returning to New York. Her work often takes its viewer into a complicated psychological state by making him or her aware of the exhausting list of issues related to gender and violence. Fendi Progeny corresponds to a suite of four prints from 2005 titled Progeny Series. The other works in the series are Prada Progeny, Jimmy Choo Progeny, and Chanel Progeny. 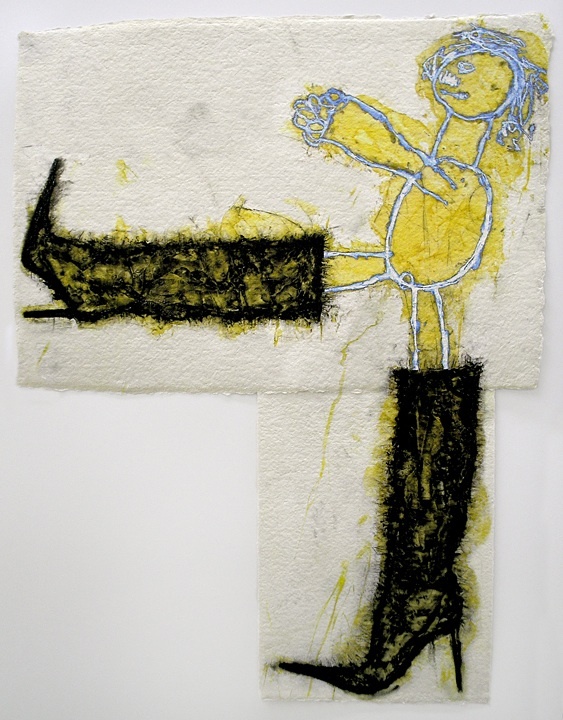 Each work in the series presents a roughly articulated figure rocking fancy shoes. The figures seem to be wearing nothing else besides their shoes as if they were intentionally exposed. A progeny, a descendant of something or someone suggests Applebroog’s feelings that we are a product of material culture and media’s standards about what women should look like. Applebroog has used high heels as a symbol for the sexualization of women on several other works including, Modern Olympia (After Versace) (1997-2001), and her Fancy Shoes Series (2003). The pose used in Fendi Progeny is revisited almost ten years later in Ethics of Desire, 2013, a work that was included in a 2015 exhibition of the same title at Hauser and Wirth, New York. Ethics of Desire presents six panels depicting nine women marching in a line, wearing thigh-high boots, silver soldier hats, and nothing else. The exhibition was installed to make the drawings, which were hanging from the ceiling, look like their subjects were participating in a "fashion cat walk," with lighting shining straight at them and lines of chairs on both sides for people to sit and look at them. The installation of the art objects reinforcing Applebroog's antagonism towards the violence and sexualization of women. Patricia Spears Jones, “Ida Applebroog by Patricia Spears Jones,” BOMB Magazine, Summer, 1999. Spears Jones, Patricia. “Ida Applebroog by Patricia Spears Jones.” BOMB Magazine, Summer, 1999, accessed March 10, 2016. Ida Applebroog interview featured in Art of the Twenty First Century. Funding for this project was made possible in part by Funding Arts Broward, Broward County Board of County Commissioners as recommended by the Broward Cultural Council, the State of Florida, Department of State, Division of Cultural Affairs and the Florida Council on Arts and Culture and private donors.